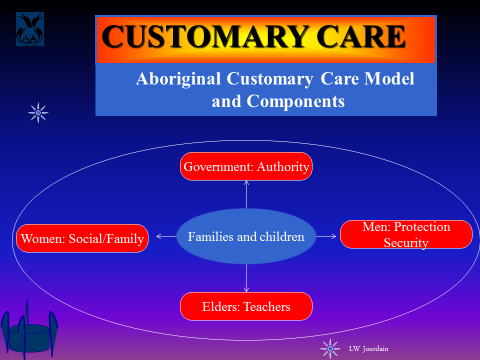 “Customary care” is a contemporary term that describes an all-encompassing approach to communities caring for their own - something our people did for hundreds of years prior to colonization. It is a “natural” philosophy of child caring that is unconditional. It has its roots in traditional society and community and is therefore inherent to our Community Care Programs. It encompasses a set of beliefs, principles, and practices through which our communities are responsible for the care of our children and the strengthening of our families. Customary care is more than a practice or way of doing things; it is a way of thinking and living. While much has changed in our communities as compared to long ago, the protection of children is no less important for us as it was long ago. The Anishinaabe people have never relinquished their right and responsibility to care for their children. 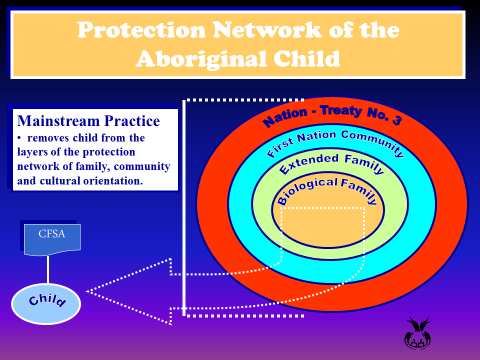 Weechi-it-te-win and its Community Care Programs Customary Care concepts and principals are based on the natural protection network that exists for every Anishinaabe child. 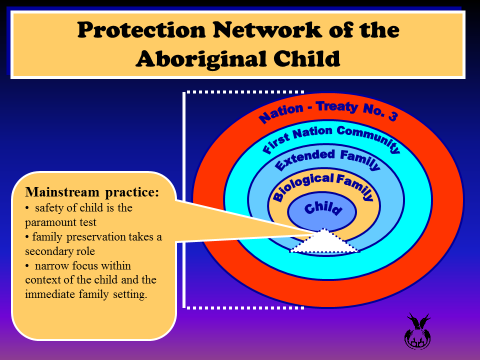 These layers of protection and the manner in which they are operationalized are significantly different from mainstream child protection practices. 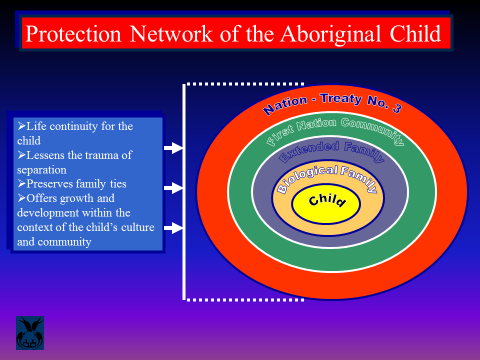 Mainstream child welfare practices are characterized by the diagram below: removal of the child from the natural layers of protection, emphasis on safety to the detriment of family preservation, and an insular focus on the child and immediate family setting with little or no consideration to the child’s broader protective network. 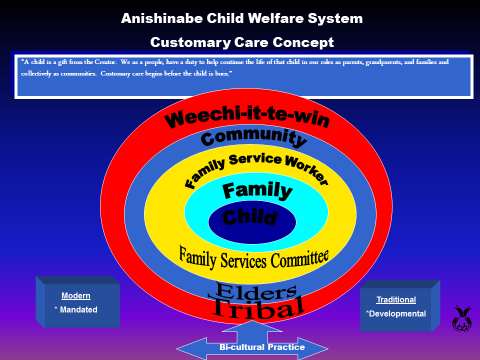 Within the framework of Weechi-it-te-win and its Community Care Programs’ customary care model, everyone within the community has a crucial role in raising, protecting, and caring for children and their families. Women have a specific role as caregivers and role models; men have a very important role as teacher, protector and provider; the Elders have a special responsibility to provide direction, help, support and guidance; and the governance structures have a specific responsibility to ensure protection and well-being for the entire community and nation. Shaw-waa-nii-maa-sa-win: Providing a helping hand without being asked, however, with the consent of the family. Supporting or assisting an extended family member with no expectation of compensation. Kaa-waa-nii-maa-saw-win: When a family would request the help or assistance of extended family member to take care of the child(ren). It was expected that the parents would help in the care of the child, remain accessible, and remain involved in any decision making concerning the child(ren). Ka-na-waa-daa-saw-win: In this situation, parents for whatever reason, would be absent or unable to provide the necessary care for the child (ren). Someone from the extended family would volunteer to “stand in for” the parents to ensure continuity of care for the child. The caregiver would act on the child’s behalf with input from other extended family members. The spirit and practice of sha-waa-nii-maa-sa win, kaa-waa-nii-maa-saw-win, and ka-na-waa-daa-saw-win are very much alive in our communities today.